Back in 2016, I began undertaking a series of entries looking at a team’s “signature” uniform. Loosely defined (and subject to interpretation) a “signature” uniform would be a uniform which one might definitively associate with a team, the one which stood out the most over the years. A signature uniform is not necessarily a team’s best uniform, or one which the team has worn the longest (although either of those could still apply), but rather the one uniform that, when you think of how a team looked at their most distinct, you have their signature uniform. Earlier this year, I resumed the series with the Montreal Expos and the Arizona Diamondbacks. If you missed the previous 2016 entries in the series, you can see them at the following links: Indians, Pirates, Astros, Mets, Rays and Padres. Today we’ll look at a team that is celebrating its 50th Anniversary in its current location: the Oakland Athletics. While the A’s have been sporting green and gold (with a momentary lapse of reason thrown in, when they went BFBS) for the entire 50 years, and they’ve been sporting their current uniform set for a fairly long time, as you’ll see, their signature look will fall into a very small window — and I think you’ll agree with me on this one. Let’s start at the beginning. The A’s franchise is in its third city, having spent 55 years in Philadelphia and then the next 13 in Kansas City. The green and gold can be traced back to the KC experiment, when charismatic owner Charles O. Finley first put the team in green and gold in 1963. In the days of white home and gray road uniforms, this was quite the radical concept, and garnered Finley lots of press at a time when people weren’t paying much attention to baseball fashion. By 1967, the KC A’s would begin wearing white shoes. So with the move to California in 1968, the A’s ditched the “KC” on their caps and added “OAKLAND” in bold, olde English lettering on their vests for that year. Unlike most teams, the A’s had THREE uniforms (green/gold, white and gray). Team members wore green/gold caps while coaches wore white ones (note in the photo below, coach Joe DiMaggio wasn’t having anything to do with the white shoes). From 1969 through 1971, the A’s would continue these vested uniforms, but starting with the year we landed on the moon, they would ditch the “OAKLAND” script and instead have just a single letter “A” on the left breast. In 1969, the vests would be adorned with the Jerry Dior MLB batterman logo, which was removed from 1970-71, and the “A” became “A’s” for the latter two seasons. Although these vested uniforms were listed as “nylon,” they weren’t the polyester double-knits that most teams would begin switching to in the early 1970s. 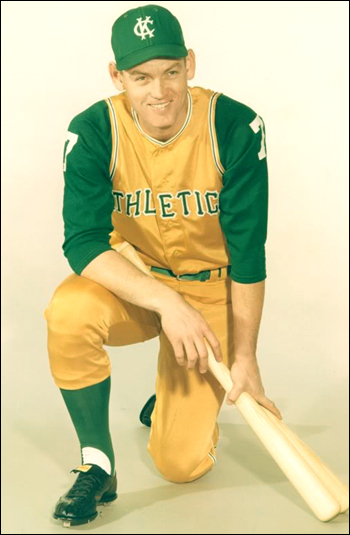 The A’s began their run with the pullover jerseys and sansabelt pants beginning in 1972 — which was a “one year” wonder. The 1972 double-knits would come with gold jerseys, green jerseys and white jerseys (and only one set of pants). Gone were the gray road uniforms (they’d wear mostly the green alternate’s on the road). These jerseys had a front number on the right side of the uniform: the only year they’d have that feature — but not all season, as detailed wonderfully by the Great Bill Henderson. The team would win its first World Series in Oakland in these, defeating the Cincinnati Reds. The 1973-1980/2 jerseys & uniforms were classics. The team won two more World Series in this set (defeating the Mets and the Dodgers respectively). 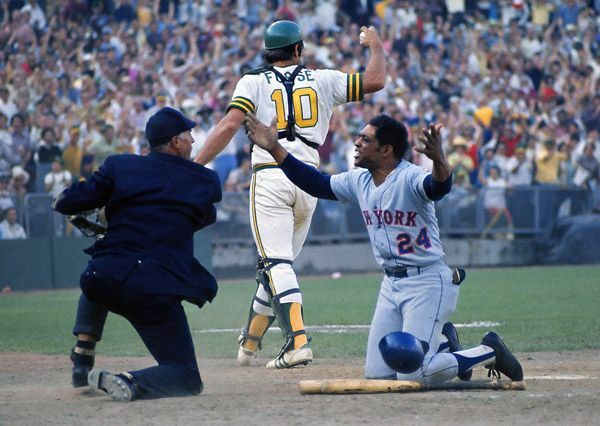 The uniforms differed from the 1972’s in that the numbers were removed from the front of the jersey, and for the gold jersey, the white lettering (A’s logo, #OB & NOB) were replaced with green letters outlined in white (except in a few instances where the 1972 jerseys were recycled). Not only would the 1973-80/2 jerseys, known colorfully as “Kelly Green, Fort Knox Gold & Wedding Gown White,” become the A’s signature look, they even turned it up a notch in 1973 by wearing mono-green and mono-gold (rarely, but they did it)! It wasn’t just that the A’s won (basically) three consecutive World Series in these uniforms that makes them their signature look — they were setting uniform trends that other teams would copy as the years went on. They weren’t the first team to go to sansabelt/pullovers, but they were the first club to wear white shoes, colored sanitary socks, multiple colored jerseys, and were one of the first teams to wear only one pair of pants for home and road games. They didn’t pioneer the modern monochrome look or the alternate jersey — but they embraced it and made it their calling card. 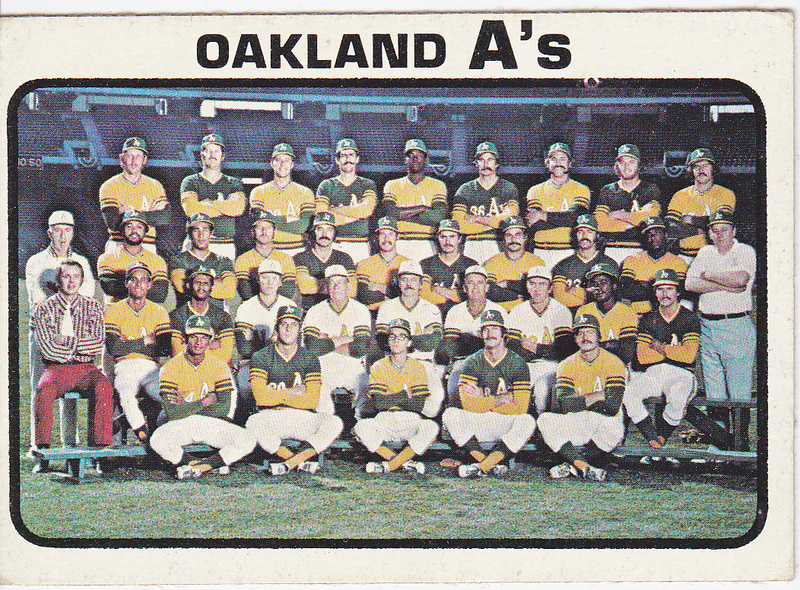 When you think of the Oakland A’s, the 1973-80 look is most definitely the one that comes to mind. The team would wear these uniforms through the 1980 season, when the first “new” uniforms would be introduced. In 1981, the team would change the gold jersey to say “OAKLAND” in vertically arched lettering on the chest. Also that year, the team would add an alternate white uniform, a button-front with “A’s” on the left chest, and they’d also wear green stirrups with white sanis (breaking from the green/gold tradition). The team would ever-so-slightly tweak the gold jersey in 1982, dropping the three-stripes on the arm hems to two stripes. After a decade without a gray road uniform, the A’s would add one in beginning in 1982, a set they’d keep until 1984. In keeping with the arched “OAKLAND” changes they’d previously made to the gold and gray uniforms, the A’s made this permanent on the green and white jerseys in 1983 and kept that look through 1986. The Oakland A’s would return to a much more traditional look beginning in 1987. They introduced two new uniform sets — a white and a gray — with button front jerseys and belted pants. The whites would read “Athletics” in a script font, while the road grays would say “Oakland” in a similar script font. While the jerseys would change slightly (as we’ll see), these formed the basis for the uniforms the teams continues to wear today. These uniforms would last from 1987 through 1992. The following year (1993), the team would make slight tweaks to the wordmarks on both jerseys: on the homes, the “A” in A in Athletics would gain an extra stroke (or embellishment); the roads would gain a “loop” in the O of “Oakland.” They continue to wear both of these sets today. Also, the club added an all green cap to supplement the green/gold one. They’d wear that with the road uniforms. The call to return to their signature look was strong, so after a long gap, the A’s reintoduced green into the jersey palate, only this time the green was a hunter, rather than kelly, green. Like the home white jersey, the green jersey would read “Athletics” in script. They would wear this both at home and on the road. In 2000, in what could only be excused as a fit of pique, the A’s inexplicably added another jersey — only it wasn’t the gold fans had been clamoring for; rather, it was a BFBS jersey that was popular in many leagues (including MLB) at the time. The 2000 jersey had a green “Athletics” script font outlined in white. I’m not sure how often that was worn, but it wasn’t often. The team jettisoned the black top after the 2000 season, but they weren’t done with the BFBS experiment. In 2008, and through 2010, the A’s introduced another black jersey — this one with white script outlined in gold. It was worn with a black cap and (for those who wore them) black socks/stirrups. Finally coming to their senses in 2011, the A’s ditched the black jersey for good and reintroduced a beautiful gold jersey with green/white piping and a return of the “A’s” wordmark on the left chest. This is a look they still use. In 2014, the A’s would ditch the green jersey with “Athletics” across the front and replace it with one similar to the new gold jersey — this one with gold/white piping and “A’s” on the left chest. And finally, entering their 51st season (and 50th Anniversary) in Oakland, the team brought back a kelly green jersey for 2018, complete with a retro-looking kelly green cap. These jerseys spell out “Oakland” (rather than “Athletics”) across the front. And there you have it. The A’s have had some interesting (and always colorful) uniforms throughout their tenure in Oakland, but there really shouldn’t be any arguments: the glorious green, gold and white sets of the 1970s, complete with white caps for coaches, were the signature look for a franchise that set many uniform trends over the years. Classic Scoreboards travels to the Music City for a look at what is arguably the most unusual ballpark scoreboard ever created. Baseball Home of: Nashville Sounds; shared with Nashville Xpress (Southern League 1993–1994. (Herschel) Greer Stadium is a now abandoned minor league ballpark located a few miles from downtown Nashville, Tennessee. Greer Stadium opened in 1978 and served as the home of the Nashville Sounds for the next 37 seasons. Today Greer Stadium remains abandoned. Several redevelopment plans for the site were proposed without success and work continues looking for a solution. One, now cancelled, proposal for the site would have kept the iconic guitar scoreboard in place. The fate of that original scoreboard remains uncertain. In 2015 the Nashville Sounds opened their new ballpark, First Tennessee Park. The new ballpark features a modern version of the classic guitar scoreboard. The unusual and distinctive guitar shaped scoreboard was installed for the 1993 season as part of several needed ballpark improvements. The original cost was $400,000. The design of the scoreboard is credited to the team’s owner at the time. It was during this time period that MLB was evaluating expansion locations. Nashville was among the locations under consideration and the guitar shaped scoreboard was intended as a center piece for a proposed new ballpark. The illustration depicts the scoreboard in its original blue, red, and white color scheme. In 2008 the scoreboard was renovated and repainted black to match the team’s changed colors. • The guitar shaped scoreboard total width is about 116 feet — 60 ft. (guitar body), 36 ft. (scoreboard/neck), 19.6 ft.(turning key section). The height is 53 ft.
• Originally the logo atop the guitar would light up and perimeter lights around the entire scoreboard flashed for home runs. • When Copley Guitar was a scoreboard advertiser, a player hitting the scoreboard received a Copley guitar as a prize. The Pirates jerseys of the early 1900s were pretty darn cool. Their undershirts might have been even cooler, what with all of those red rings around the sleeves. I’ve wanted to paint them ever since I learned of their existence from Marc Okkonen’s research, which at this point must have been about 20 years ago. I had always thought, though, that if I were to paint somebody in them, it would be Honus Wagner. I was thrilled when my client opted for Fred Clarke instead. For those of you who are unfamiliar with him, you might not be alone. He wasn’t necessarily the star of those early Pittsburgh teams, but he was certainly a big reason for their success. He batted over .300 eleven times, stole over 30 bases seven times, and was a very solid left fielder, leading the NL in fielding percentage nine times. Not to mention the fact that he became player/manager in his first year with the club (1900), helping them rise from 7th to 2nd place. His Pirates won the pennant four times during his tenure, winning the crown in 1909. 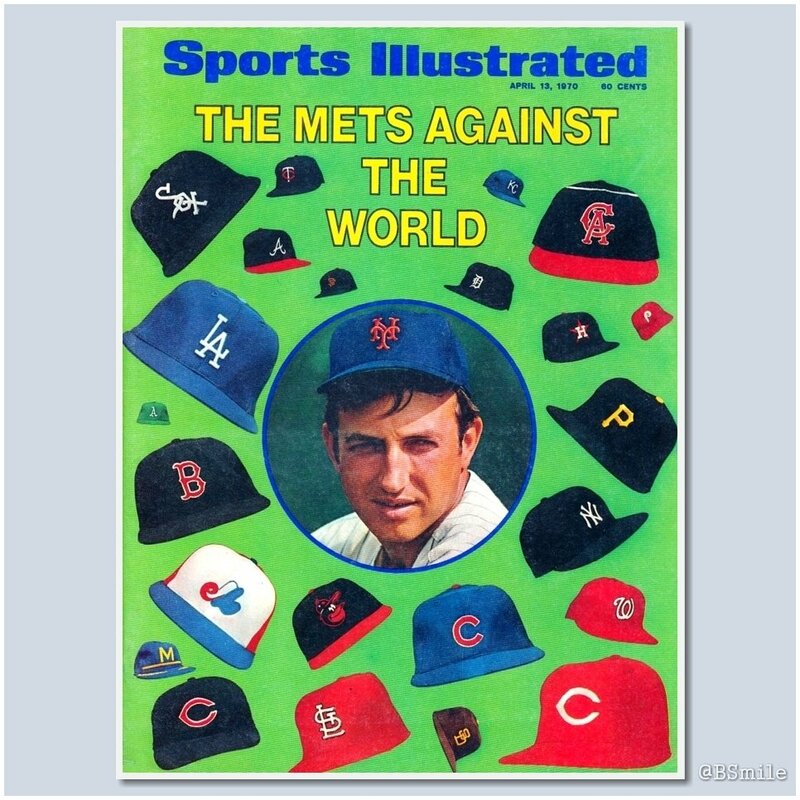 Baseball News: Check out this awesome Sports Illustrated cover featuring the caps of every MLB team from April 13, 1970 (from @BSmile). 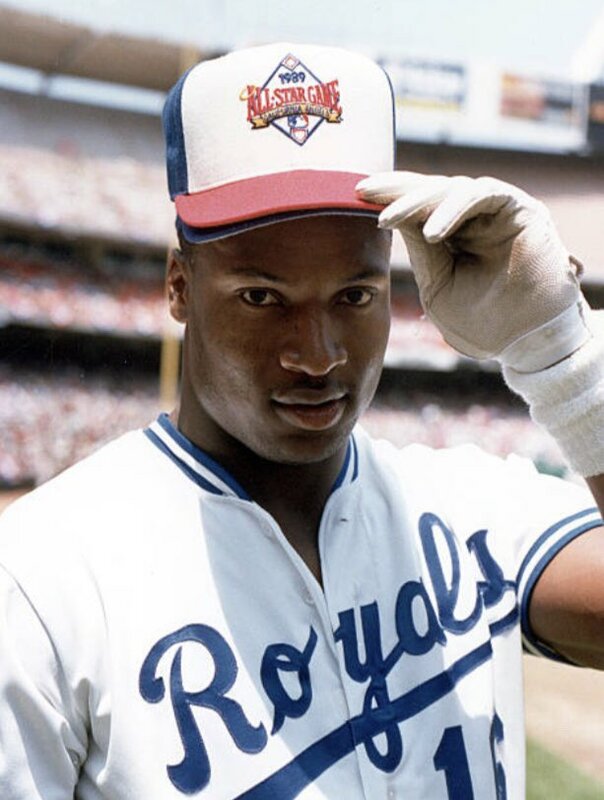 … Bo Jackson looked good in the 1989 All-Star Game cap. That pic is not from Kaufman Stadium, so I bet it was the actual All-Star Game itself in Angels Stadium (from @GoatJerseys). … FanGraphs has a great look at how the White Sox cap has become ingrained in pop culture (from Eriq Jaffe). … The Triple-A Toledo Mud Hens have debuted 3D helmet decals at their home opener. Correct me if I’m wrong, but I believe that makes the Mud Hens the first Minor League team to adopt 3D helmet decals (from Kurt Schooley). … The Takeout has an explanation of eight food-based Minor League and independent team names (from our very own Alex Hider). … The University of Houston is giving away throwbacks on April 20 (from Ignacio Salazar). … The University of North Georgia’s softball team is wearing USA Baseball-inspired jerseys. 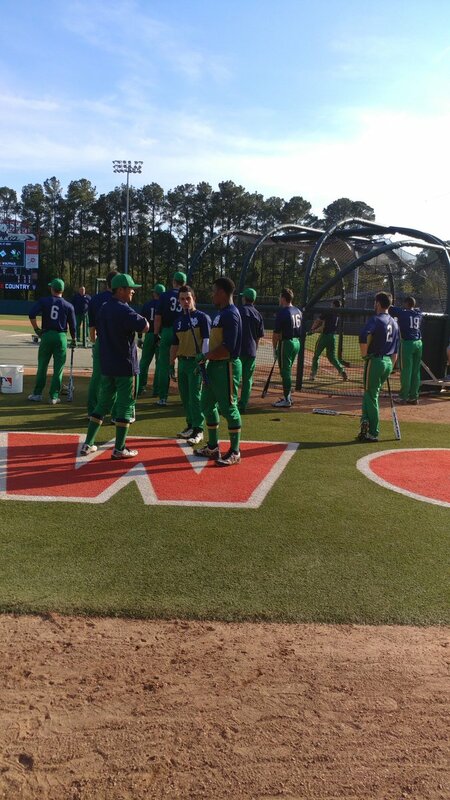 … Notre Dame rocked the green pants yesterday (from Justin Bates). … Baseball shorts sighting! Or, softball shorts, I guess. 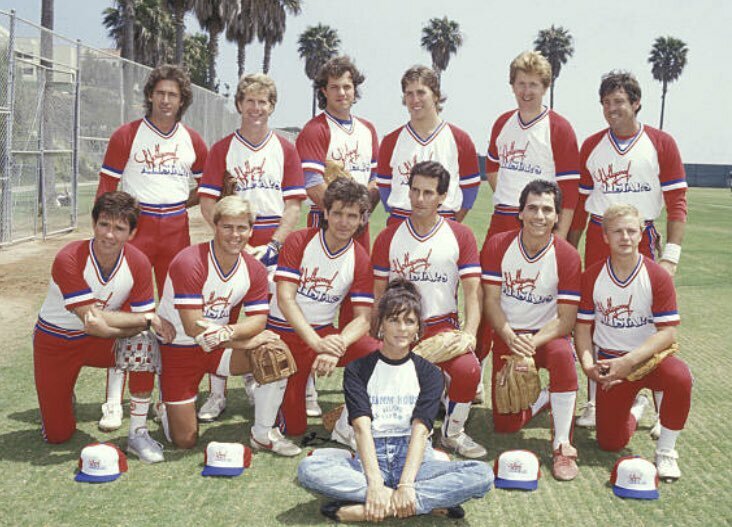 That’s from a mid-80s celebrity softball game, but because I was born in 1994 I have no idea who a single person in that photo is (from from @GoatJerseys). 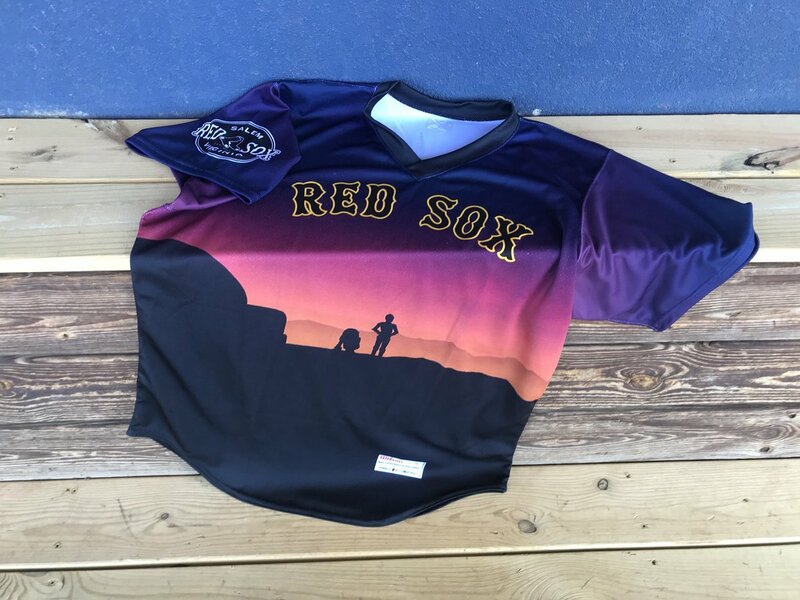 … The Salem Red Sox will be wearing these Tattooine-inspired jerseys on April 28, which is their “Star Wars Night” (Not May 4???). From MiLB Promos. 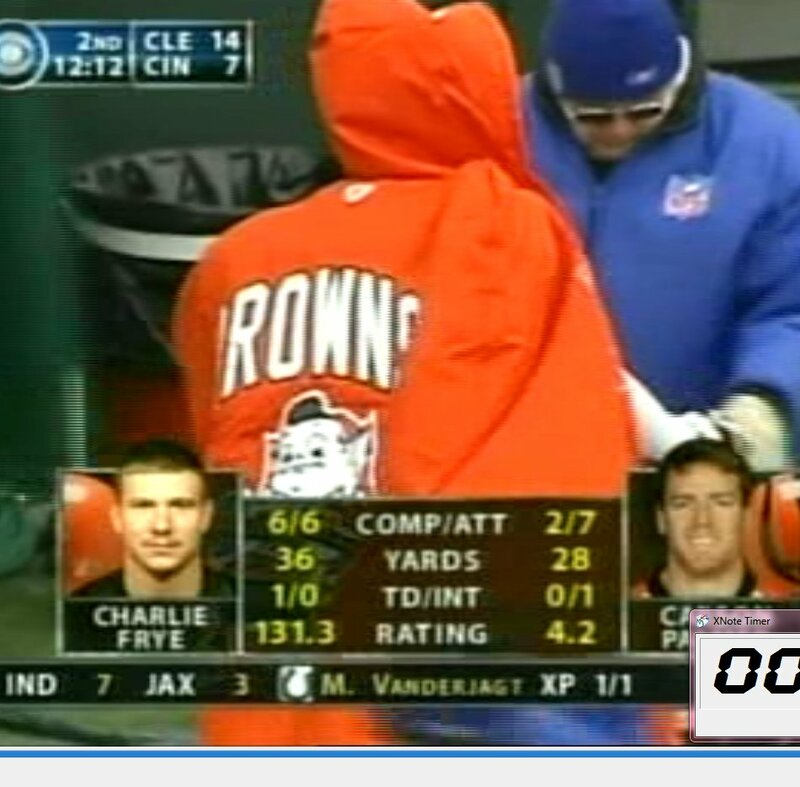 NFL/Pro Football News: Check out the Brownie the Elf jacket Charlie Frye was wearing in 2005! (from Jordan Casper). 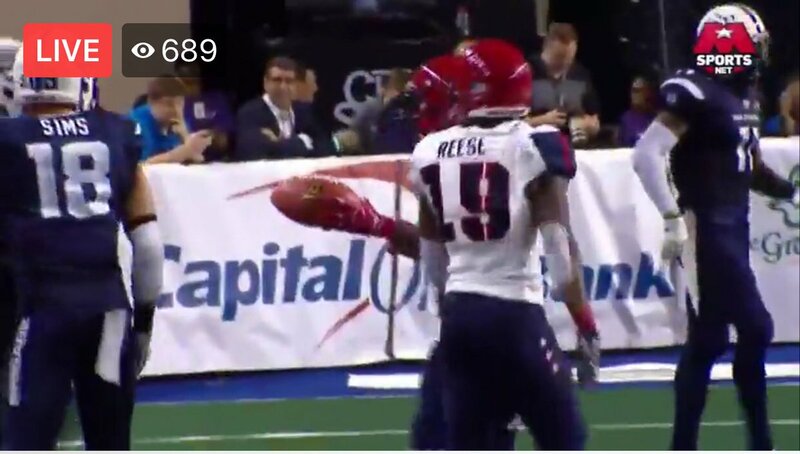 … The Arena League’s Washington Valor seem to be going without helmet logos this year, or at least for that game (from Darian Somers). College/High School Football News: Florida State DB Levonta Taylor showed off an awesome-looking black-and-red matte helmet on his Twitter account, though purists will probably cringe (from Drayton Jackson). 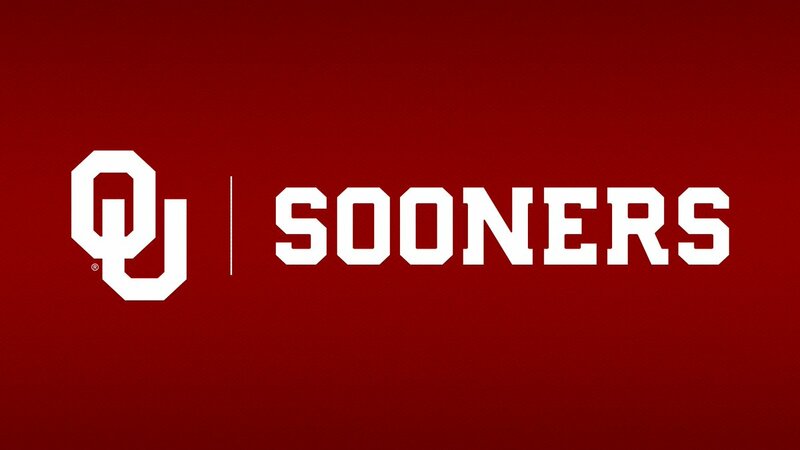 … Oklahoma “refreshed” the official athletic logos (from Kevin C. Burns). 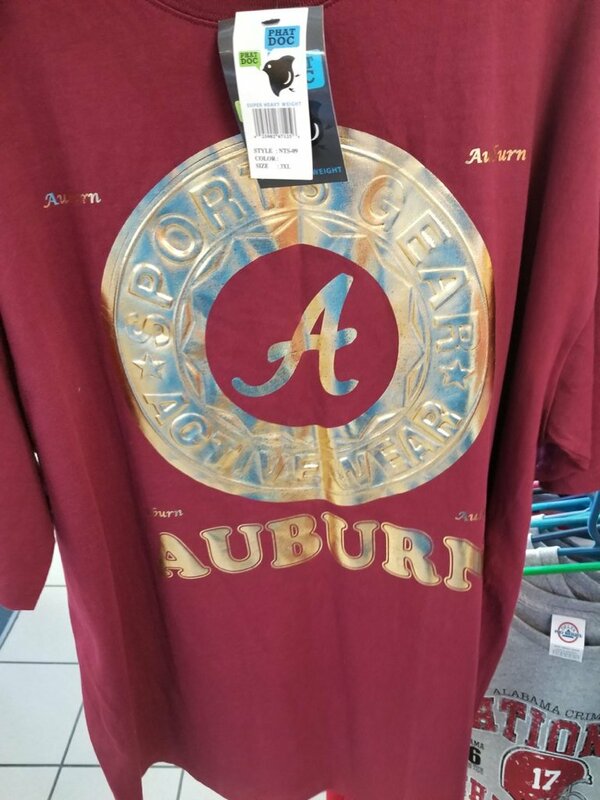 … This Auburn/Bama crossover T-shirt will upset everyone in the state of Alabama (from @Goalline_Stand). 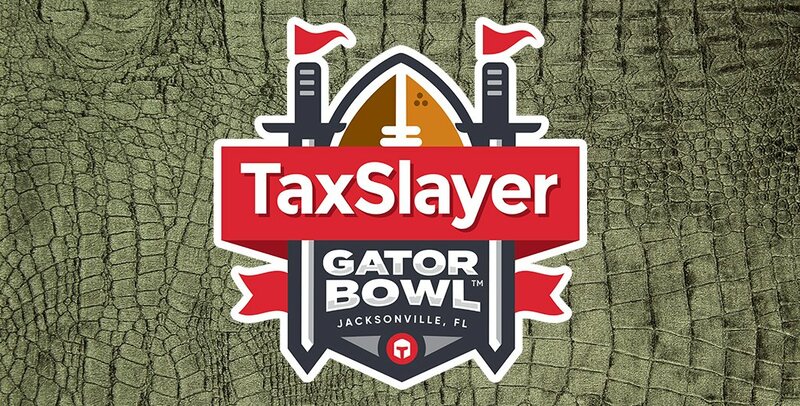 … The logo for the 2019 Gator Bowl was released, but more importantly, the Gator Bowl gets to be called the Gator Bowl again (from @Greggo_82). Hockey News: The State of Liberty at the New York New York Casino in Las Vegas got its very own Golden Knights sweater for the playoff run (from Mike Chamernik). NBA/College/High School Hoops News: ESPN has a rundown of the history of NBA players in protective masks (from Mike Chamernik). 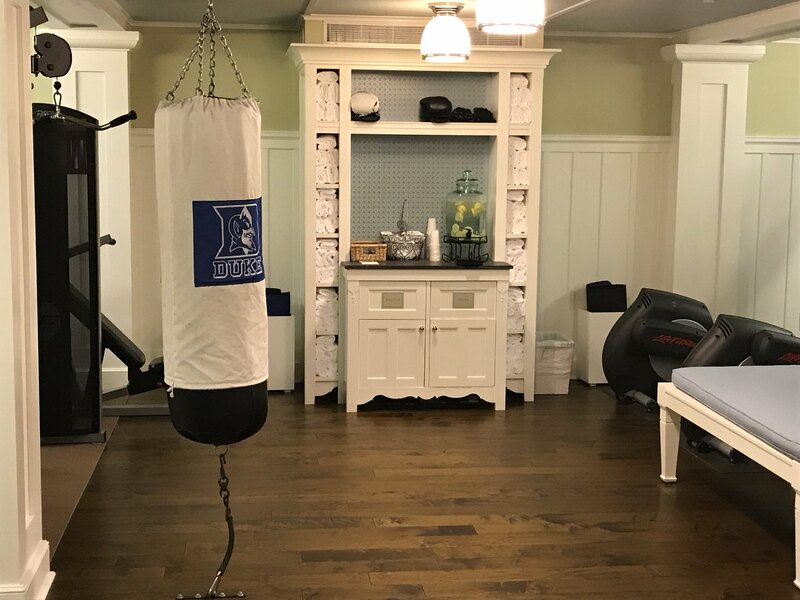 … The Carolina Inn’s fitness room features a punching bag with a Duke logo (from James Gilbert). Soccer News: Premier League Champions-elect Manchester City have had their new away kit leaked to Footy Headlines. … Rumor has it that Istanbul-based club Galtasaray’s new kit will feature a Bosporus Strait motif. The European and Asian halves of Istanbul are bisected by the Bosporus. I should note that the kit in that link is NOT the official kit, but a fan’s take on the rumors. … Sevilla has released their 2018 Copa del Rey Final kit (from Josh Hinton). 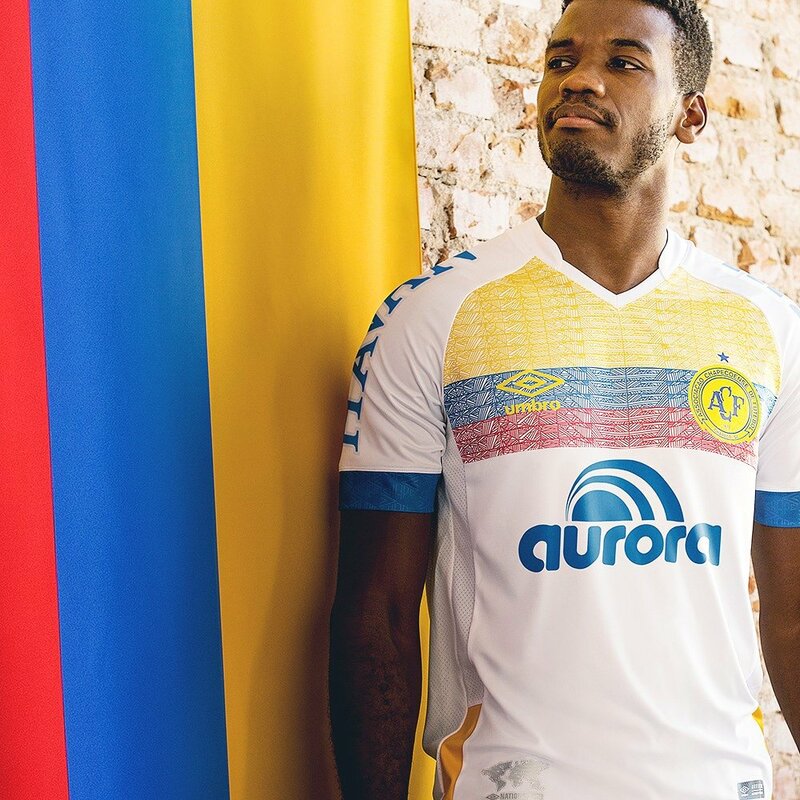 … Chapecoense, the Brazilian club that lost most of its squad in a tragic 2016 plane crash in Colombia, has released their new away kit. The Colombian flag motif is to show thanks to Colombians who assisted the club immediately after the crash. Grab Bag: Hugh C. McBride writes in with some major news on the corporate douchebaggery front: “An artist named Penelope Gazin was invited to display a piece at a show in LA that was co-sponsored by Adidas & Shepard Fairey. She signed her painting “PENELOPE NIKE GAZIN” and drew a swoosh over her signature. When the event organizers noticed this, they forced her to remove her painting & leave the show.” Unbelievable. … Every season, the National Lacrosse League’s Colorado Mammoth lets children with cancer draw on their helmets using special helmet wraps. Here are this year’s helmets (from Zeke Perez Jr.). That Sports Illustrated cover is amazing. I remember hearing the story of how the Brewers recycled the Pilots’ old uniforms, but did they ever take the field (in spring training or otherwise) with the “scrambled eggs” cap with the M on it – as seen on the cover? I’ve never seen the ’70 Brewers wearing the “scrambled eggs” hybrid cap – seems like it was just a last second edit for the SI cover, replace the Seattle “S” with the Milwaukee “M”. Of the Brewers were to adopt the actual Pilots wheat stalks, rather than the incorrect scrambled eggs that replaced them in collective memory, it would go swimmingly with the Brewers overall theme, and would be a nice nod to the franchise’s origins. The Pilots were sold on April 1, 1970, so the SI folks took a swing at what the Brewers hat would be, not too bad for a quick-change! Outstanding A’s/Athletics recap. Charlie Finley may have been a SOB, but his club’s uniforms were ahead of their time. And precedent-setters. Phil! Awesome job on this A’s article! One conspicuous omission on an otherwise-great A’s uniform history was the noticeable darkening of the green in the early 1980s. You referenced going back to kelly green throwbacks this season but made no reference to the change when it happened. Agree 1973 to 1980 definitely the signature for the A’s. Nailed it again, Phil. The moustache was also a part of that signature look. No no no no no…they’re the White Sox, not the White Sanis. I guess that’s a Brewers cap w a Pilot stripe on the SI cover? Must have caught a sight in mid evolution. That may be actor Doug Mckeon with the blond hair kneeling far right first row and possibly actor Peter Berg kneeling third from right with his glove resting on his thigh. I’m not positive about these sightings but they seem plausible. Anyway for a celebrity game they really went C list. Not much star power here. Second from the right, standing is James Widdoes of Animal House and the first season of Charles In Charge. They A’s most significant change in the early 80’s occured in 1982 when then abandoned the Kelly green for forest green with the caps. The forest green piping was on the home uniform and was seen in block letters depicting “Oakland” on the road grays. This occurred the year Ricky set the stolen base single season record. Agree with the A’s signature look. Loved it when I was a kid, still love it. Love that they’ve brought back kelly green (are you listening Eagles?) and gold. Sure, they’ve had some misses (the recent green has been way too dark, IMO and the BFBS was not a good look), but over the years they’ve consistently had some of the best unis in baseball. I’m not a fan of the dark green as compared to Kelly green but standing alone it’s still a good look. The only bad uni was the BFBS. I have always loved the A’s unis. And As others have mentioned, the only wrong turn was the bfbs experiment. 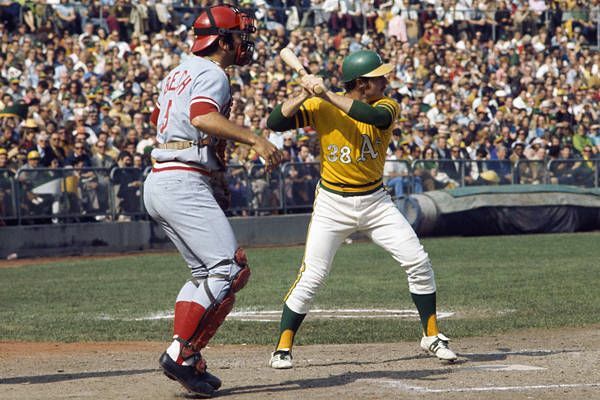 My favorites will always be the early 70’s vested jerseys with the “A’s” logo. Especially the road grey. Could not have done better on the signature look for Oakland. Boy, that short lived Expos font front number looks so out of place, especially with McAuliffe Red Sox on the back. The trend in MLB has been piping on the colored top jerseys. The A’s have it on theirs. The problem is that they didn’t add it to their pants. Doing so will recreate the indellible image of their 70s classics but for a new generation. While I agree that 1969 was perhaps the best season overall for baseball uniforms, it would make the world a more cool or full place if all teams (except the Mets) went back to their late 70’s styles. I like 1979 in particular with the A’s, Padres, Pirates, Orioles, Giants, etc… wearing very colorful unis. Other than the scourge of pajama pants and the lack of proper stirrups, I would argue the current uniform generation is pretty darn good. Of course the silliness of Mother’s Day, Fathers Day, Memorial Day etc. uniforms are a joke, almost all MLB teams have a pretty solid look on the field. I don’t know if anyone has done a study but it does seem like more MLB players are going high sock or stirrups. Maybe the dark trend of pajama pants is reversing. Need to go more in the direction Lou suggests – more colour. Not every team needs colourful uniforms but some more variety would be great – think it could be more readily accepted among the “newer” teams. Current generation of uniforms is okay – taken as a whole they are too bland; drowning in a sea of grey. I agree that the special/holiday day ‘novelty’ uniforms are godawful and pajama pants are a sight that causes sore eyes. Wow- the Browns were leading in that “Brownie” shot. A rare find! Ah, the tyranical apostrophe – totally unnecessary and without any basis in grammar. It’s been with us for decades, going completely unchallenged. Of course, the countless jerseys and caps over the years should say, “A”. The unnecessary ‘ is insidious, like the unnecessary leap when making a play near the wall. Here’s another example: “they’d wear mostly the green alternate’s on the road”. The apostrophe can also use to show a an omission of letters for the purpose of abbreviation. It does not always indicate possession. You might find this discussion interesting. Doesn’t the fact that it’s an abbreviation make the reason for the apostrophe obvious? No brainer. All white w/pullover top mid 70’s A’s uni best all-time uniform any sport any time. The birth of the darker green in ’82 most unwelcome. However, the black hat w/ green A’s logo, best of all the ridiculous MLB BFBS iterations. Great job on the A’s, Phil. I’ve always loved their look, and these signature look articles have been both informative and enjoyable. I’m actually looking forward to your take on the Angels. I was talking to a couple of guys in a sports bar the other night, like ya do, and they didn’t know that the Angels were a year older than the Mets, or that they’d been in the same stadium in Anaheim for over 50 years. I’m not personally a fan of the current look for them (red on red is problematic, and I’d like something that said Los Angeles — actually, I’d like them to be the California Angels again), but the uniform worn by Nolan Ryan, Rod Carew, Don Baylor — I think that’s under-appreciated, as is the history of the Angels in general. I have a picture of me in the early 90’s standing next to Kevin Duckworth at a softball tournament in Astoria OR, where he had a team called the Double O Ducks. He’s wearing a basic sweats and screen printed shirt softball uni, and I’m wearing a Ken Griffey Jr shirt (with contrasting blue turtleneck… a favorite look of mine) and a White Sox cap. Great lede today. I agree with your assessment of the signature uniform because it is classic in color and appeal. While the focus was in the uniform, the signature look for me is all about the shoes! The white cleats made those uniforms. Ill also say that certain players make certain unis stick. This is why the eckersley era tops and the mac and canseco era jerseys are so memorable. I definitely think the Oakland A’s 1970s uniforms represented their signature look. Since switching from that look in the early 1980s, they just haven’t been the same A’s. 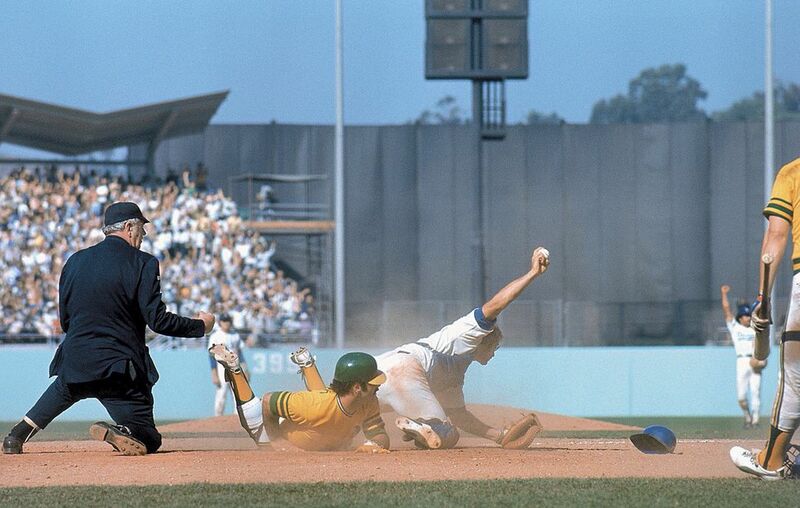 Finally, in the late-60s A’s uniforms, in some color photos the A’s road grays looked borderline mint green. Great recall! The article mentioned that in 1981 the A’s added the alternate home white button-front jersey with “A’s” on the left chest. That jersey didn’t debut until the following year which was when the A’s switched from kelly to forest green. Great work on the signature look feature today, Phil. Being a life-long A’s fan who’s followed since 1968, you nailed it all. I lived through all those uni changes and you nailed each and every one – even the slight modifications. You even captured the 1982 season where they wore the white button front for one season, and was the ONLY year they wore white sanitaries and green shoes on the road. Angel Stadium was actually named Anaheim Stadium in those days, and yes that picture is from Anaheim Stadium. Great review of the A’s uniforms. I recall that, st some point, the road vests were a distinctly greenish-gray. I apologize if that was already mentioned. The road pants were the same greenish-gray. Why do you have a problem with REDSKINS but you offend Mexicans with Cinco de Mayo references? I mean, she pretty clearly got exactly the reaction she was going for…kind of a brilliant publicity stunt really. Great recap on the A’s unis. Loved their uniforms from the 70s. Was hoping the A’s would wear them this season for their anniversary season. No such luck! Can someone answer this question? Why is it necessary for MLB teams to wear gray pants on the road? When I see the classic A’s uniforms, they always wore white pants at home and on the road. Is there an MLB rule/mandate that teams must wear gray pants on the road. Most of the uniform colored jerseys look much better with white pants. That Greer Stadium scoreboard is outstanding. Three years after the Sounds left the park, it’s still there, and the rest of the stadium looks no worse than it did when they were usuing it (because the place was already a dump!) Great job as usual, Gary Chanko! A’s have some of the best uniforms in sports.I wish they would utilize their older designs more. I’m glad the Astros have taken that step.